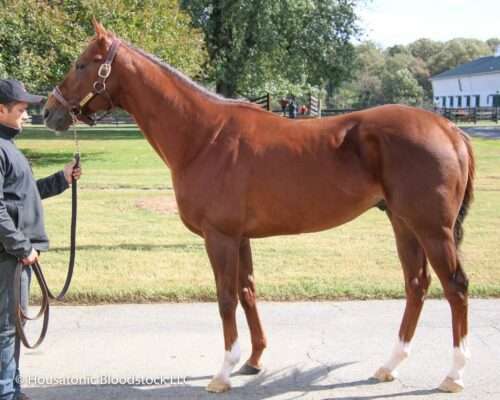 Unlike the first two mates of her breeding career, who were both turf-oriented Roberto-line stallions in the form of Dynaformer’s sons Temple City and Point of Entry, the Juddmonte-bred Harlan’s Holiday mare Gosling will visit Irish War Cry in 2019, in a Housatonic Recommended Mating. New to stud in 2019, Irish War Cry is a son of Curlin, one of the top handful of sires in the country these days, and one that gets both turf and dirt horses — although he is seen more as a classic dirt influence these days because of the types of mares that he gets. Dirt is the surface over which Irish War Cry raced exclusively, having been an unbeaten, stakes-winning juvenile before taking the Grade 2 Holy Bull and Wood Memorial stakes at 3-year-old, when he also placed in the classic Belmont Stakes. Irish War Cry returned at 4 to add the Grade 3 Pimlico Special to his resume, as well. But his trainer, Graham Motion, suggested that Irish War Cry could have handled turf just fine had he been given the opportunity, and the success of Curlin’s offspring on that surface — not to mention that of Irish War Cry’s 3/4-brother Irish Strait, who is a Grade 3 winner on turf — supports Motion’s claim. Although Gosling comes from a deep Juddmonte family that has excelled on turf for generations, she is a daughter of the dirt runner Harlan’s Holiday, whose offspring include dirt Grade 1 winners like Into Mischief and Shanghai Bobby — all of which points to the possibility that Gosling’s foal by Irish War Cry could have a considerable amount of versatility when it comes to its racing proclivities. Harlan’s Holiday, of course, is a grandson of Storm Cat, and Curlin has had plenty of success when mated with Storm Cat-line mares in general — as did his sire, Smart Strike, who got Grade 3 winner Fair Point from just three foals out of daughters of Harlan’s Holiday, more specifically. And Irish War Cry showed more speed and brilliance than many sons of Curlin, which we think will make him even more well-suited to this particular cross. The stakes-caliber horses in Gosling’s female family have achieved their success almost exclusively in Europe recently, and like many European runners their pedigrees have been loaded up with the influence of Northern Dancer, although Group 3 winner and multiple Group 1-placed runner Phoenix Tower (out of a half-sister to Gosling’s dam) is by Mr. Prospector’s son Chester House, and Phoenix Tower’s stakes-placed half-brother Diplomatic Agent is by Deputy Minister. Curlin is a grandson of Mr. Prospector and out of a mare by a son of Deputy Minister, so we think those successes bode well for the match of Gosling with Irish War Cry, as well. Not to mention that Irish War Cry’s broodmare sire, Polish Numbers, is a son of Danzig, by Northern Dancer, so this foal will get some more of that blood as well. Physically, both Irish War Cry and Gosling are big-bodied, strong horses, and Irish War Cry will hopefully add a bit of leg to Gosling’s foal.